Reporters from two prominent news outlets, the Huffington Post and the Des Moines Register, have been denied press credentials by Donald Trump's campaign in recent days. While the reporters were still able to attend Trump events as members of the general public, the refusal to grant press access raised eyebrows back at their newsrooms. Staffers at both outlets said the withholding of credentials seemed punitive. A Trump campaign spokeswoman declined to comment. "I have written stories that have been critical of nearly every single presidential candidate on both sides of the aisle. I have never been treated this way or not allowed media access ever," said Samantha-Jo Roth, who has been covering the Republican primary race in Iowa for the Huffington Post. Roth said she'd developed strong source relationships with Iowa-based Trump campaign staffers over the summer. So she was surprised when she was told she wouldn't receive credentials for a Trump rally at Urbandale High School this past Saturday. Local staffers "told me they were handed down the orders from the national staff, and had no other information. They apologized, and said they felt bad," Roth said. Why did it happen? Perhaps because the Huffington Post has been publishing Trump coverage in its entertainment vertical rather than under politics, much to the chagrin of the campaign. "I made a few phone calls and discovered this was happening because of Huffington Post's decision to keep all news about Trump in the entertainment section," she added. "I was told I will be denied any cooperation from the campaign and will not be credentialed from now on until something changes." Roth went ahead and attended the rally in the general attendance area. Some of the site's other staffers were surprised Roth's credential request wasn't rejected sooner. Scott Conroy, the site's senior political reporter, said the campaign stopped credentialing him back in July, around the time the Huffington Post moved Trump into the entertainment section. Conroy noted that Trump is still covered in the politics section "when it's within the context of the broader campaign." The Trump campaign also denied credentials to the Des Moines Register, Iowa's biggest newspaper, starting in July. The campaign said it was a response to an editorial in the newspaper calling on Trump to drop out of the race. News stories and editorials are generally written by separate, independent staffs. At news outlets like the Register, the distinction between the two sides is a serious matter. But from the Trump campaign's perspective, the Register's editorial and the Huffington Post's entertainment branding are examples of disrespect and unfairness. 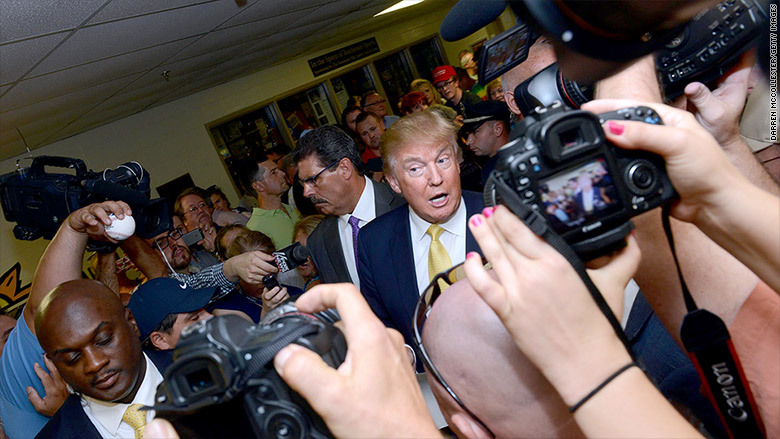 Register reporter Jason Noble calls the Trump campaign's response a "freezeout." Most recently he was denied credentials for two Trump events on Saturday, including the same rally as Roth. While the rejection of the state's largest paper may be symbolically significant, Noble downplayed the practical effects. "Each time we've been denied press credentials, we've still been able to access the event and cover it in exactly the same manner as if we had received credentials," he said. "On Saturday, being denied press credentials essentially meant there was no place to leave my backpack and no table to put my laptop on."